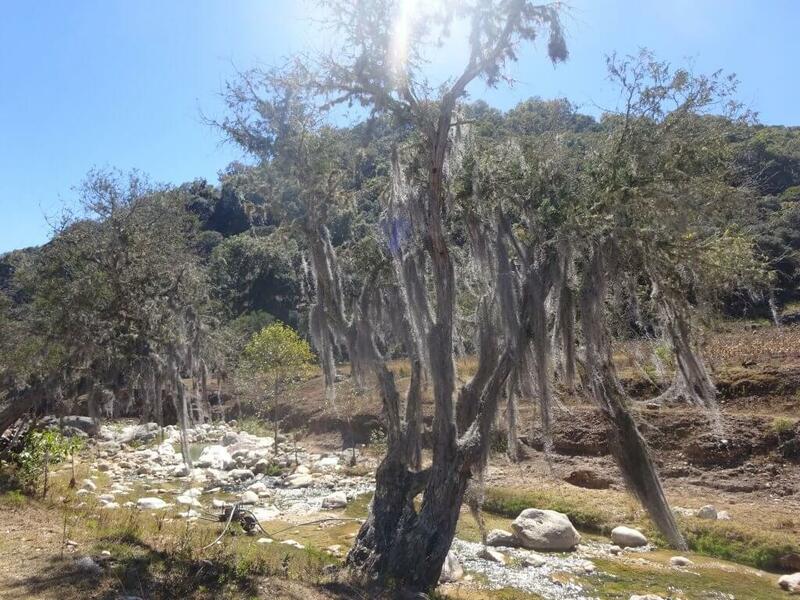 Since being in Oaxaca I had been looking forward to my trip with Tierraventura Ecoturs. 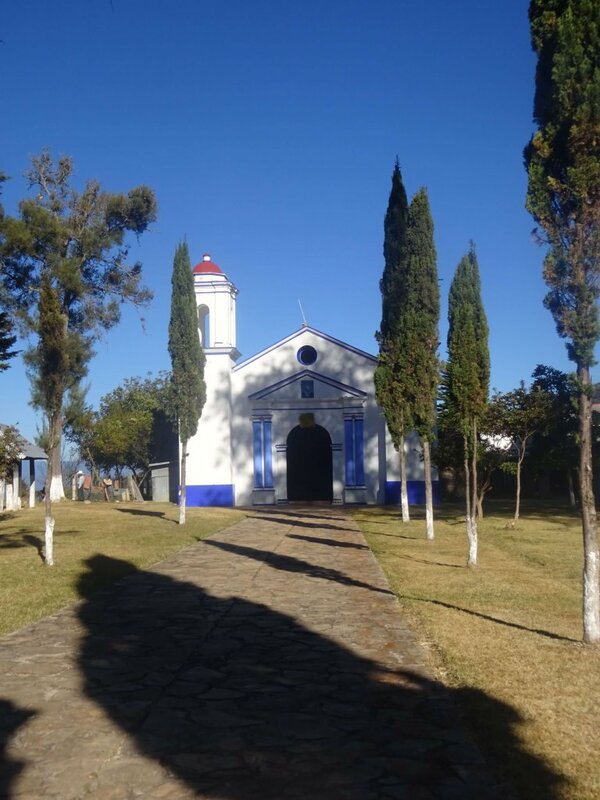 The two day trip to Santiago Apoala included a couple of hikes and an overnight stay in a remote village. This meant actually getting out into the Mexican outdoors, with someone who knew the good hikes. Plus, it would make a nice change from cities, beaches and ruins. Disclaimer: I was hosted by Tierraventura Ecotours on their Santiago Apoala trip in exchange for honest and unbiased coverage. All opinions are my own and this post tells of my personal experience on the trip. Me and Dave were getting picked up from Luz de Luna Nuyoo at 8:40am, so we would only just manage to grab breakfast! We were at breakfast at 8:20am, ten minutes before it technically opened, but our host didn’t mind. If I haven’t mentioned before, the owned of Luz de Luna Nuyoo really was lovely! As we were grabbing a quick bite, we asked about storing our larger bags for the night – no point taking everything! Luckily, there were two lockers spare that would fit our bags and this was ok with the hostel. You can’t get better than that! After stowing our bags away, we had a few minutes before the pick up time. But just as we got comfy on the hammocks the doorbell rang! And yes, it was our tour! We expected them to turn up at about 8:50 at the earliest, you know, Mexican time, but no, they were early. We joined Yves a the door, who introduced himself and led us to the minibus. Inside was the rest of the group, which consisted of two more couples and the other tour guide, Claudia. The other couples were two Swiss girls and a guy and girl from Australia, quite the mixed bag! We quickly set off and were soon all chatting away. As we had a long drive ahead of us, the plan was to head to a nearby market first, so that people could grab some breakfast if they needed to. 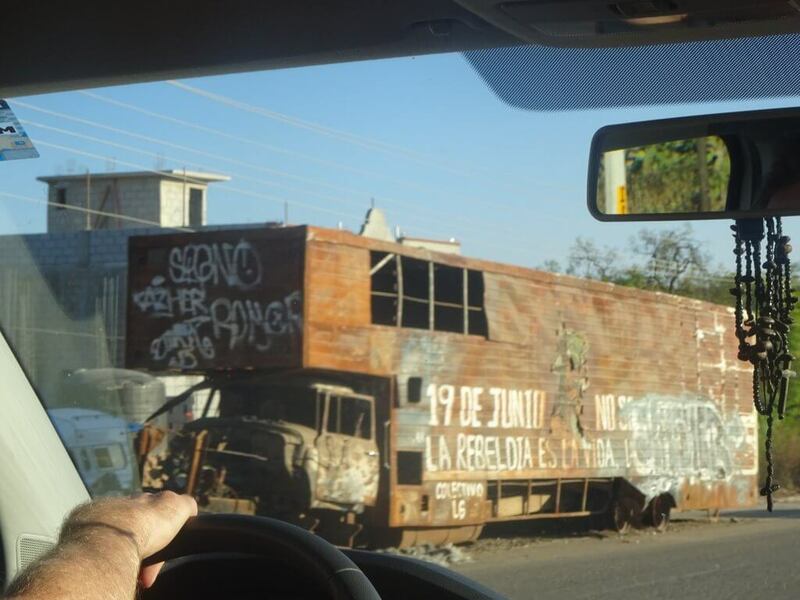 On the way we had to weave around some old burnt out buses and lorries that had been left in the road. Yves told us that these were from the teachers strike that happened a few years ago. They have been left on the road as a reminder. It seemed eerie, these husks left in the road, that will not be moved. After avoiding the burnt vehicles on the road we reached a small market. Here we were let loose for half an hour. As me and Dave had managed to grab some breakfast before we were picked up, we just went for a wonder. We went through a bit of the market and found a church. It was a cute little church and still had Christmas decorations. We didn’t go in though, as it looked like there was a mass or something going on! We arrived back at the minibus earlier than we thought we would. So we waited for the others. Luckily, they all appeared within a few minutes and we were back on the road again! A short drive later and we came across some roadworks that completely blocked the road. This wasn’t a problem though, as it wasn’t far at all from the usual drop off point. 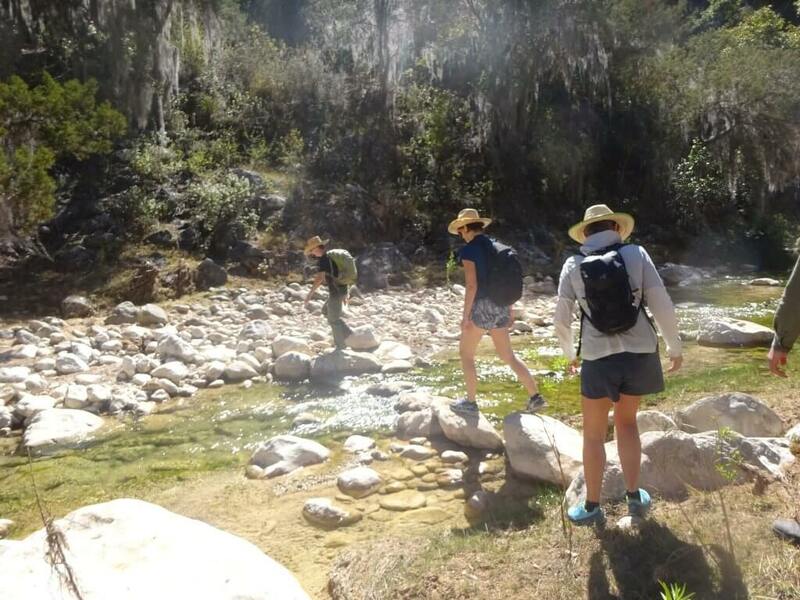 Here it was time to get out of the bus and start walking to our accommodation in Santiago Apoala. Yves would join us for the hike, whilst Claudia would drive to the village. So making sure we were equipped with hats to shade us from the sun, we headed off the road and down into the canyon. The hike was fairly easy to begin with, there were lovely views and we were going at an easy pace. However, we soon began to steeply descend. Just before the descent, someone had the clever idea of asking if there had been any injuries on this walk. There had been two, on the descent. Yay! But we all made it down without too much of a problem. There were no injuries, not even much slipping and sliding like I thought there would be. After the descent it was an easy walk through the canyon with numerous river crossings. 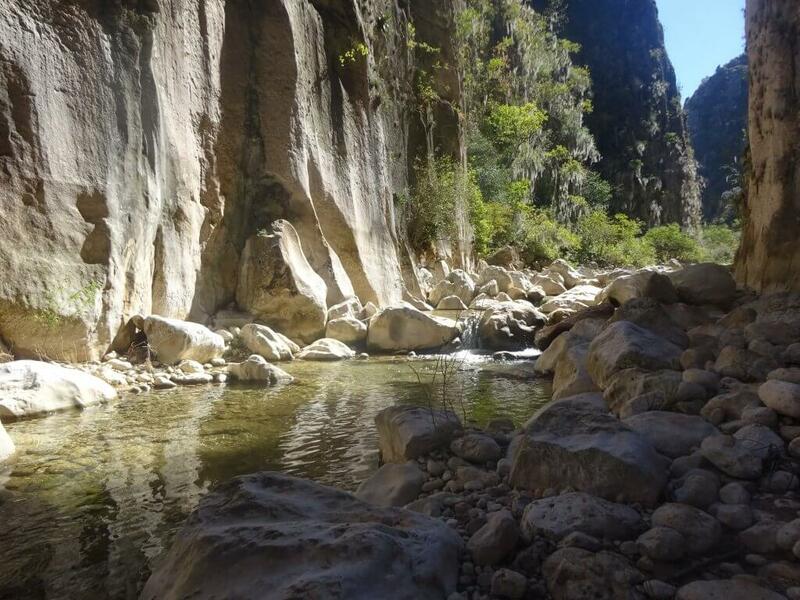 Walking through the canyon was a hot and tiring experience, but that doesn’t mean it wasn’t good fun. Yves would happily answer any questions we had about the plants we stumbled across or just generally anything. 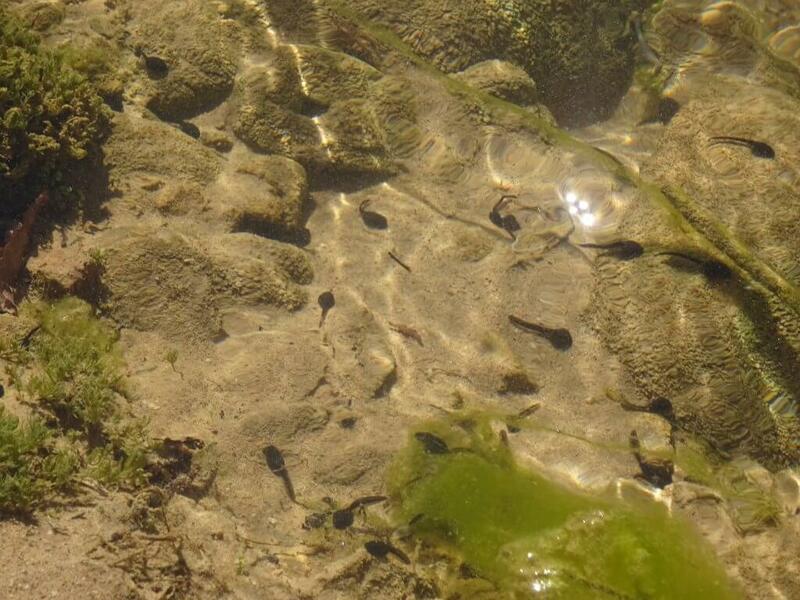 As we walked we came across flowers, agave, tiny cacti and tadpoles. There was also a huge grasshopper! 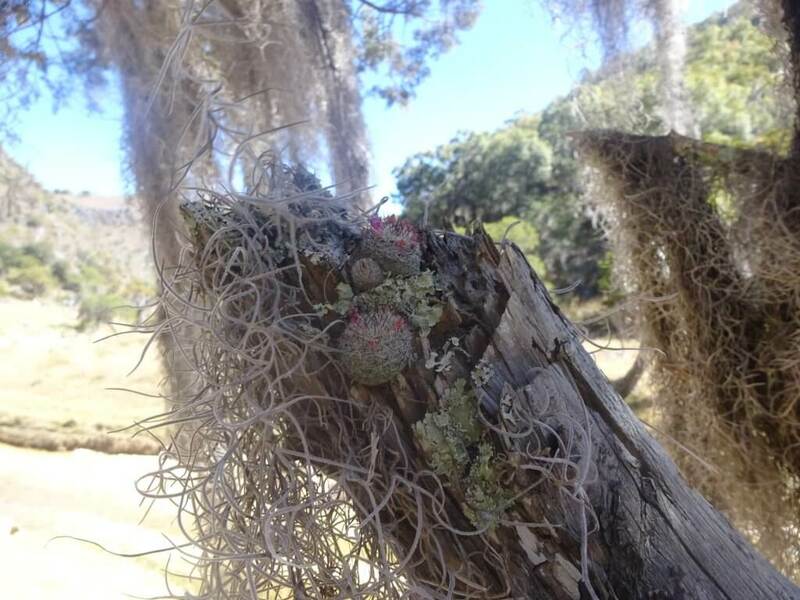 One of my favourite sights was Spanish Moss. This moss drapes the trees and has an eerie effect. They create ‘ghost forests’ if there’s enough of them in an area. I wouldn’t like to be in one of those in the dark! There were also some locals, with their animals. Yves told us not to take pictures of the people or the animals, as the locals believe in the evil eye. They believe that if you take a picture it allows the evil eye to get to the animal or person and make them ill. The belief is that the evil eye can even cause death. 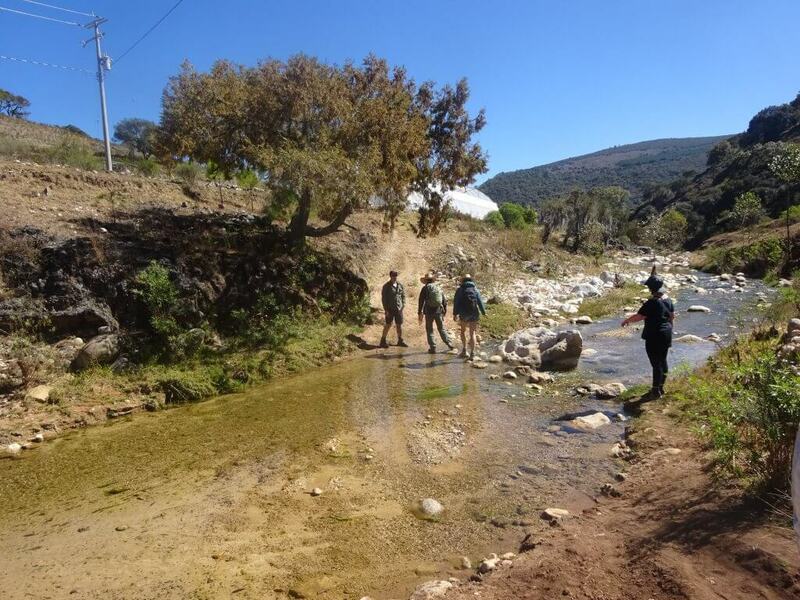 One of the main things I remember about this walk, was the river crossings. The first one was pretty easy. And I would’ve thought that they’d get easier as I got more and more used to crossing the river. And some did, but some definitely got much harder. Quite a few feet got wet as there was more than one slippage! But Yves was always on hand to help when needed. After a few hours and about five river crossings, Yves stopped us for lunch. So we all sat down and Yves unpacked his bag. Yves has good taste in food! He’d brought some cereal snacks that were covered in chocolate and a local favourite, chalupines. The chalupines were with peanuts, which gave them a salty taste. They were really good. If you don’t know what chalupines are, they are grasshoppers! 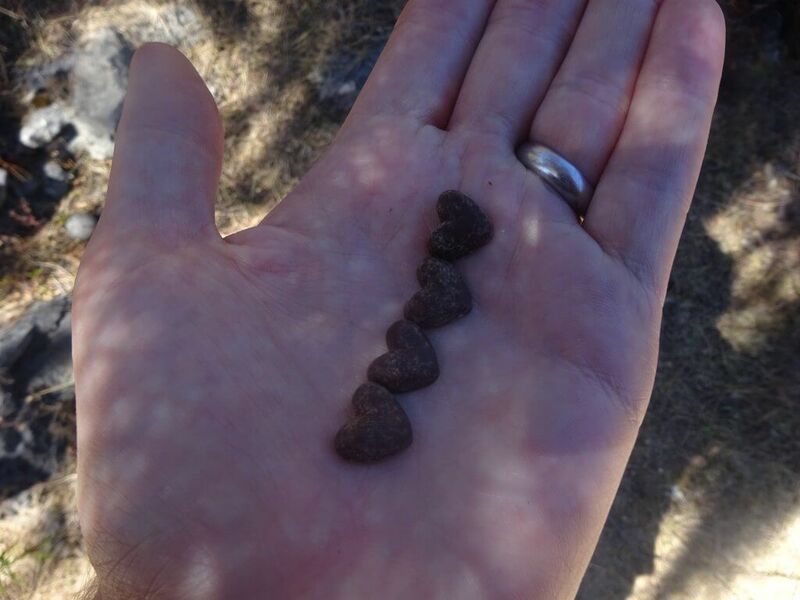 The Swiss girls had also brought some snacks, in the form of chocolate hearts. 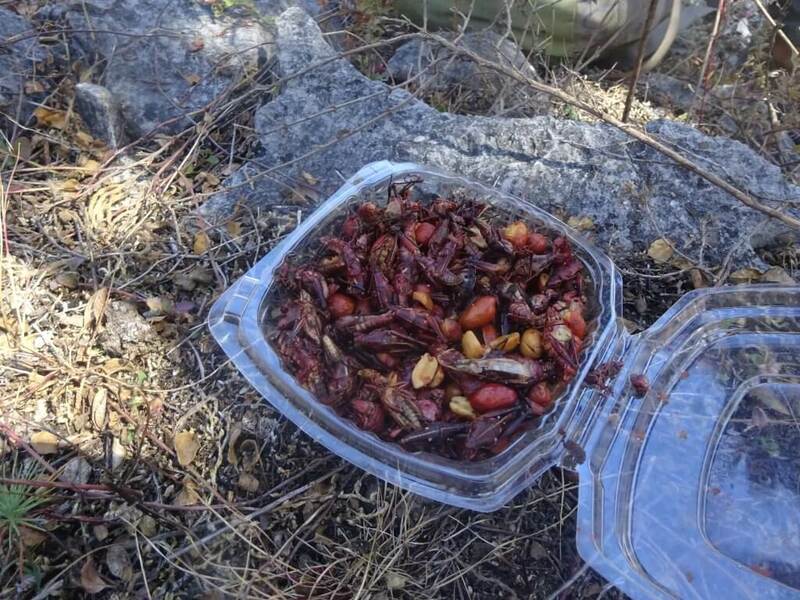 They have a tradition of always taking chocolate with them on a hike and couldn’t break that tradition even in Mexico! After eating (and possibly eating too much) we all shouldered our packs again and were ready to carry on. There were a few more river crossings on the way, and maybe a shoe or two got wet! At this point in the hike we actually came across other tourists – an entire five. Yves told us that he has never seen so many tourists here before! 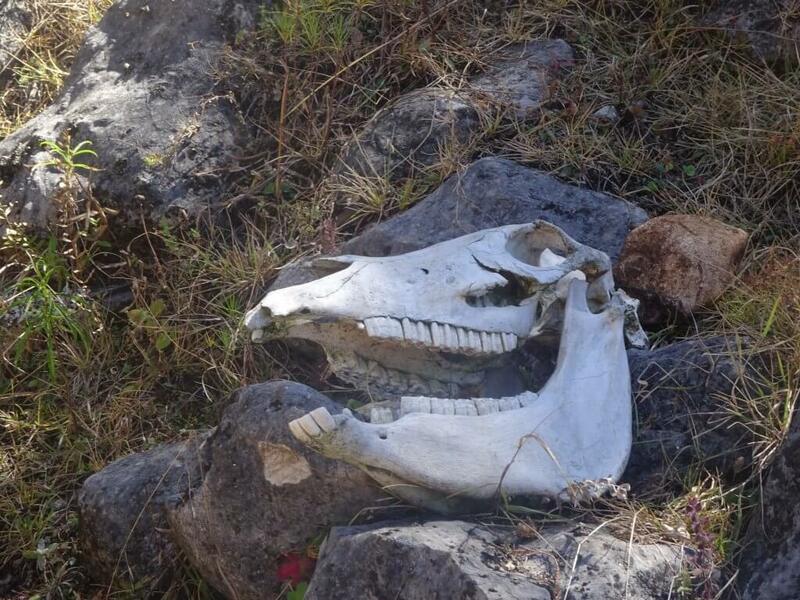 As we walked along, Yves also pointed out a horse skull. He told us that it had been there for years and he has watched it decay over time. Lovely… Now it is just the bones that are left. I find it weird that it has been left for so long! Coming to the river at one point, we had a little surprise. There was a couple swimming in the river. But not just swimming, they were skinny dipping! Quite an embarrassing situation when they realised that they were directly in our path. But it gave us all a bit of a giggle. After the final river crossing we literally followed the river up through a canyon. There were two men with a dog going the same way and the dog was terrified of the seven white people! He literally stayed as far away as he possibly could. 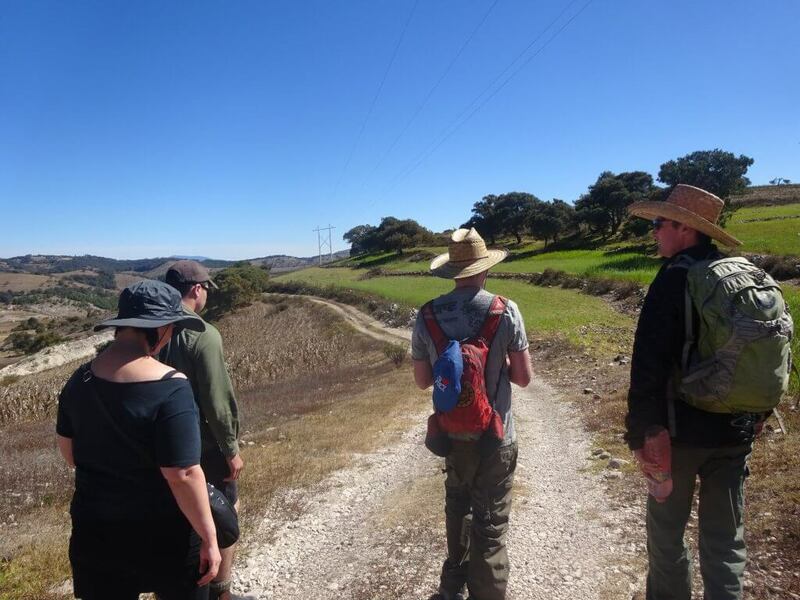 It didn’t take too long to scramble along the rocky river bed and soon we came across a green field with cabañas above it. These cabañas would be our homes for the night. The cabañas were much more than I’d expected. I knew we were going to be in the middle of nowhere, so hadn’t expected much from the accommodation. All I expected was basic, you know a bed and share bathroom, nothing fancy. How wrong was I? The rooms were spacious, airy, ensuite and even had hot water! Absolute luxury compared to some of the place I’ve stayed in! And with a view of the river, the location wasn’t bad either. After dumping our stuff Claudia and Yves took us for lunch. Yes I say lunch again, as what I thought was lunch turned out to actually only be a snack, there was much more to come! 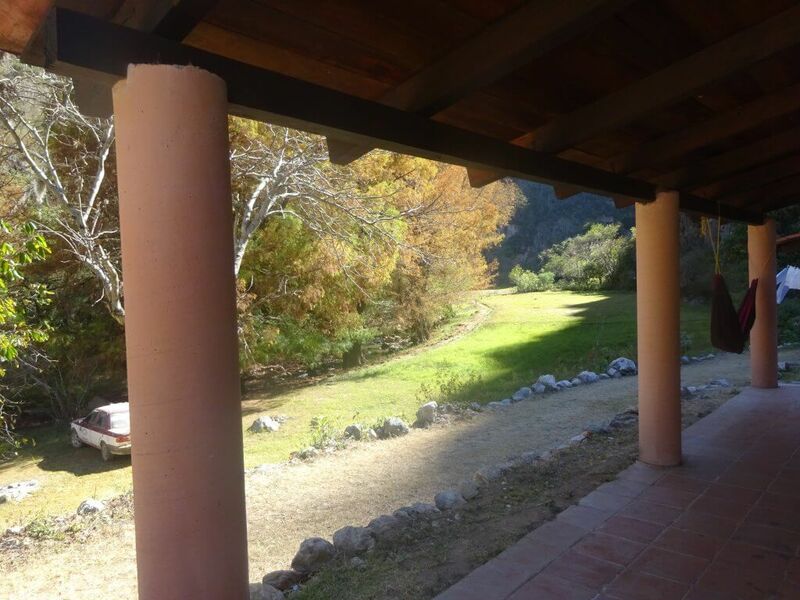 The cabañas were only a short walk away from the town, maybe a little over five minutes. As we walked, several stray dogs came for a look at the strange white folk. Claudia also pointed out “The Devil’s Cave”. There is basically a cross in a cave in a cliff, which marks the location of the Devil’s Cave. In this cave the bones of child were found. No one knows how they got there, so the only logical explanation is that the Devil kidnapped the child and ate him/her. Obviously. We arrived at the tourist centre in just a few minutes. The tourist centre here is multipurpose; it rents out cabins, serves food, has a small shop and of course has maps available and guides to hire. The food here was good Mexican fare. There was a pasta soup to start. Then we were served with tamale, rice and beans. So much food! But after the hike I think we all needed it. And of course there was Jamaica, which is a very refreshing drink made from hibiscus flowers. Over lunch Claudia gave us an insight to the area and Tierraventura. The company is helping small towns like this to bring in tourists. 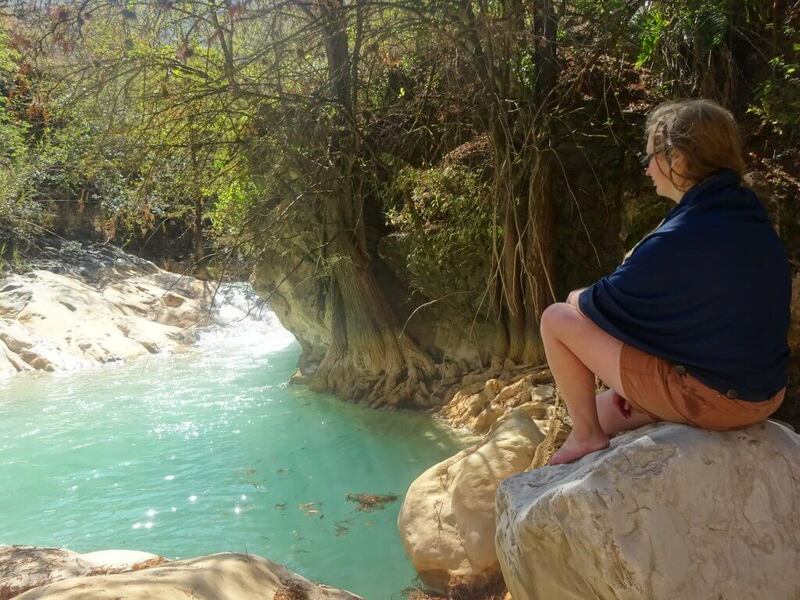 These towns are surrounded by natural beauty that people should see, but the locals don’t always realise how beautiful their surroundings are. They only bring small groups, so that there is little impact, but they always involve as much of the community as they can. For example, we would have dinner at the only restaurant in town, so that everything is even. It seems like a great idea and it will hopefully develop further, without damaging the communities. Hopefully it will help small communities like this thrive and become more accessible to travellers. Leaving the tourist centre, Claudia and Yves took us around the side, where there is a mural. 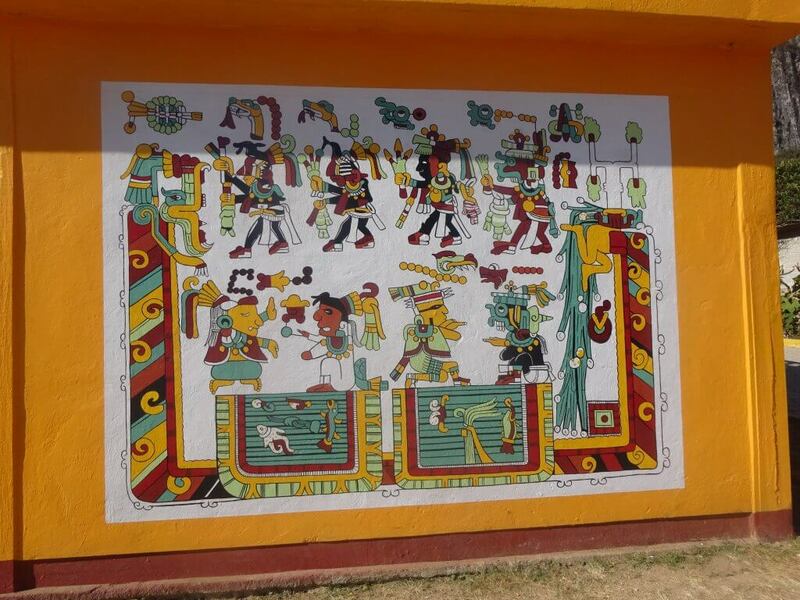 The mural depicts the birth of man, which the locals believe happened in Santiago Apoala. There is a cave with a waterfall, which is where man came from. The tree of life is also depicted as it features heavily in many myths and legends of the native people all over Mexico. Claudia and Yves took us for a tour of the town. It didn’t take long! We went to the cathedral, walked through some fields and crossed a river. Claudia and Yves knew everyone and stopped to say “Hola” on more than one occasion. As we walked through one field, an extremely happy dog ran to greet us. She was a lovely dog, she had to say hello to everyone before following us for the rest of the afternoon. During the tour we were taken to the home of a woman who weaves baskets. She showed us a few in different sizes. They all had a similar pattern, which is typical of Oaxaca. 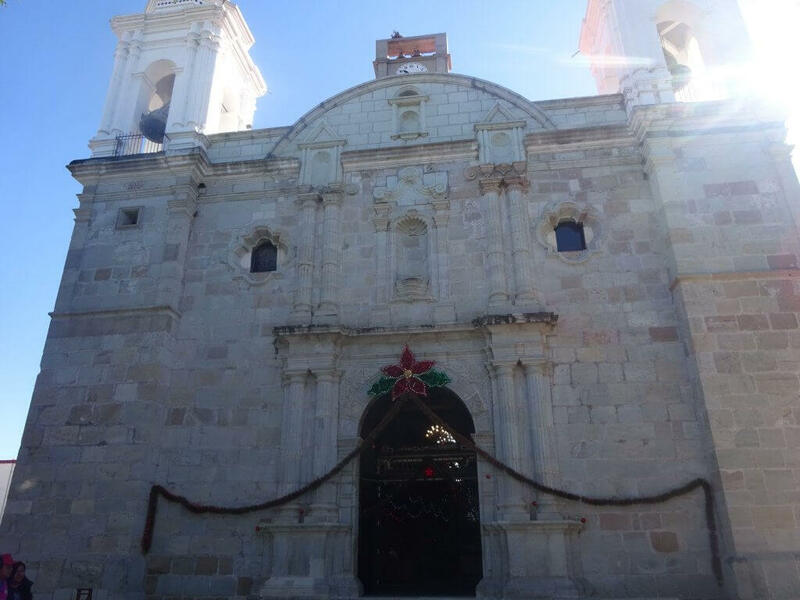 They use square patterns that can also be seen in the ruins in Oaxaca. Once we got back to the cabañas, we had some free time before dinner. So me, Dave and the Australian couple headed back to the Tourist Centre to buy some cerveza. Well, when you have a lovely view outside of the cabañas and a sunny evening, what could be better than a few beers and getting to know some new friends? As the sun disappeared behind the mountains it became a little chilly, but just as we decided to go in, everyone else came out ready for dinner! So we headed over to the one restaurant in town, which was just behind the Tourist Centre. The restaurant is caller El Centauro. 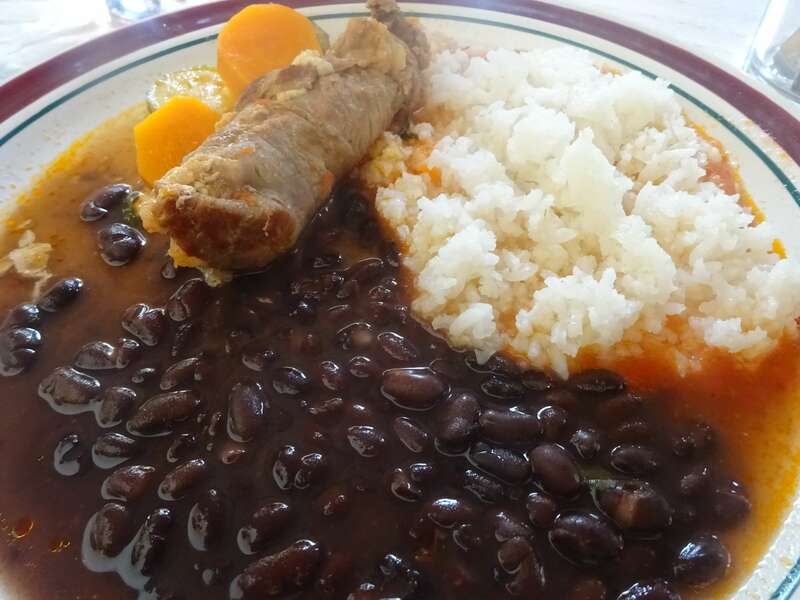 The dinner was Mexican style – they have their main ‘big’ meal for lunch, then just something small for dinner. It was a very small restaurant and we were the only customers. You could see into the kitchen wherever you sat, where there were two women. One of the women came out and bought us three molotes each. These are a corn-based pastry; the dough is made with corn and potato. They are then stuffed with different fillings and then fried. 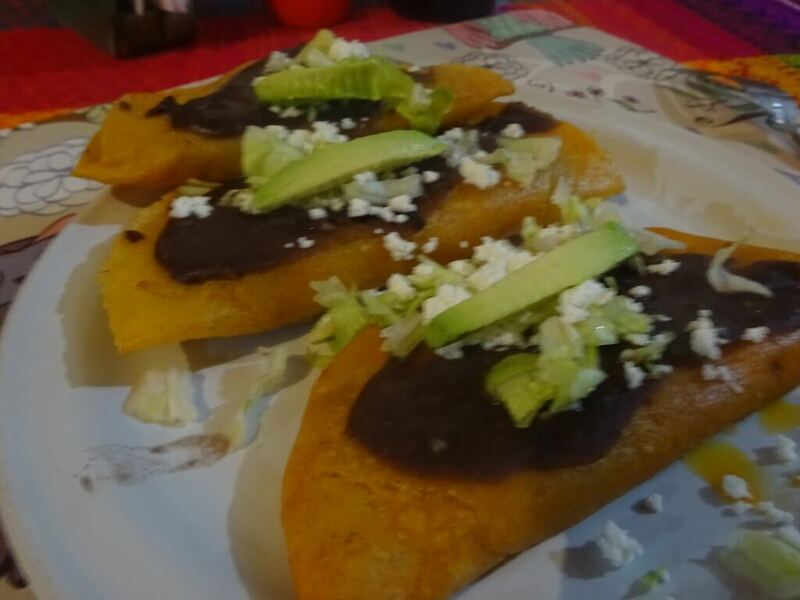 Ours were filled with chorizo and had shredded lettuce, feta and a slice of avocado on top and they were so good! We also had a mescal each, which was pretty good. Whilst eating and drinking we talked about this, that and everything. We had some strange conversations and some good laughs. One topic we spoke about at length was natural healing. Claudia is very into natural healing and the beliefs in Mexican culture. 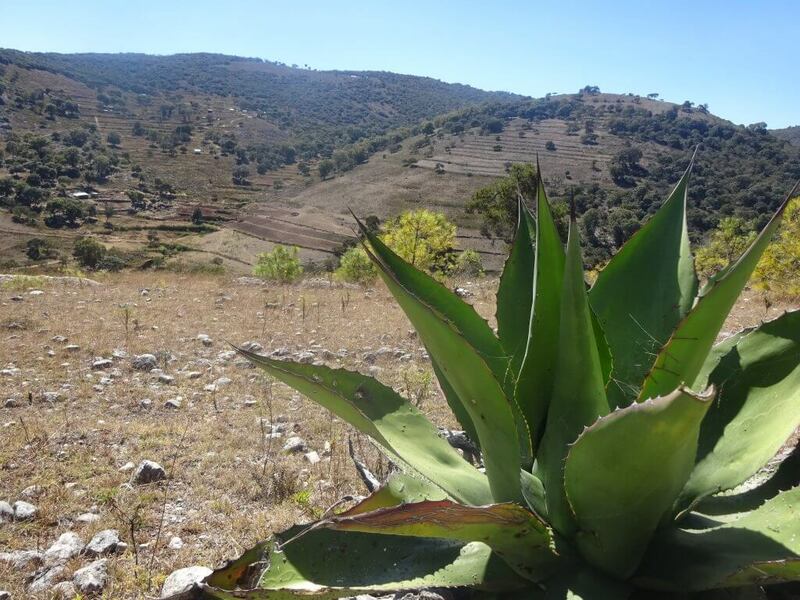 This is why Tierraventura offer traditional medicine tours. She explained a lot about temazcal, told us stories about people who have had a traditional healing ceremonies, shamans and more. I found all this very interesting, as I love learning about things like this! The next day we headed back to the one and only restaurant for breakfast. In the kitchen the same two women were pottering around, I wonder if they even left? Once again it was very Mexican food, obviously since we were in Mexico! We started with some sweet bread and hot chocolate, which is always good. When in Mexico you dip the bread into the hot chocolate and it is so good! 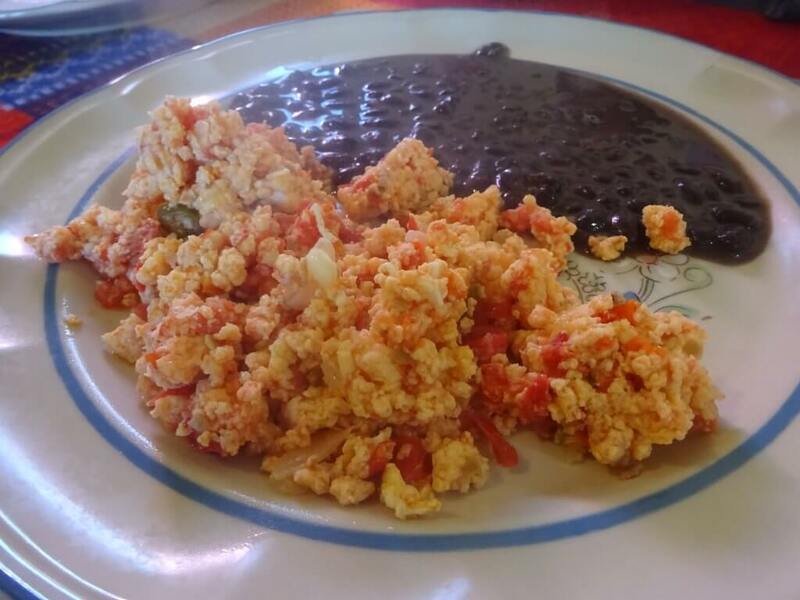 I thought this was it for breakfast, but Mexican eggs and frijoles soon followed. After breakfast we started out on our hike, both Claudia and Yves came with us this time. We would be going to a waterfall nearby, so we went to the Tourist Centre and turned right. This was part of the village we had not seen before, well the village actually ended here really! We were soon descending into a valley, going past agricultural fields. The views were once again spectacular. Just amazing. As we walked Claudia and Yves were happy to point things out and answer all of our questions. 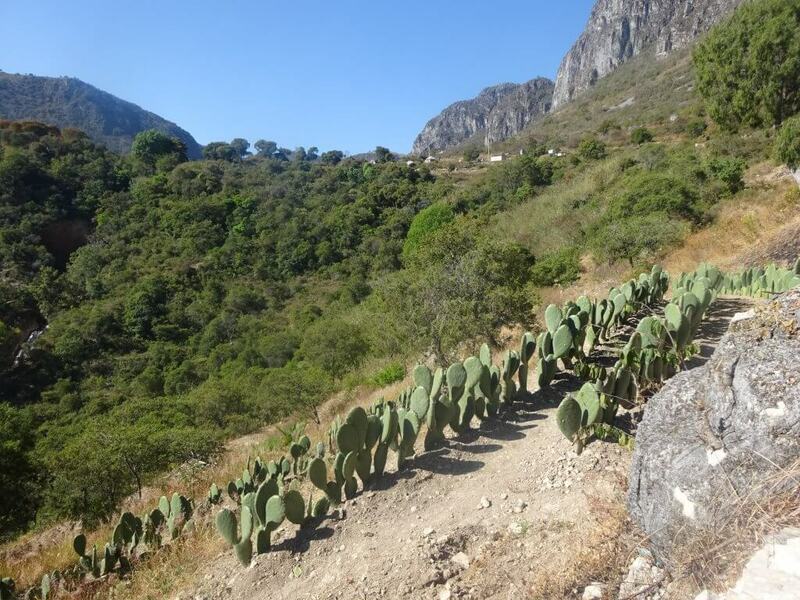 As we walked we passed some cacti, Yves told us that that these cacti weren’t grown for what they produce, but for the worm that feeds off them. The worm has many uses, but is actually a parasite of the cactus. The worm is used to make natural dyes; it produces a vivid red colour. After going down a little we went to the edge of a field, where we had a great view of a waterfall. It was not the fall we were heading to, but it was definitely impressive. We stopped here for a short rest and lots of photos. 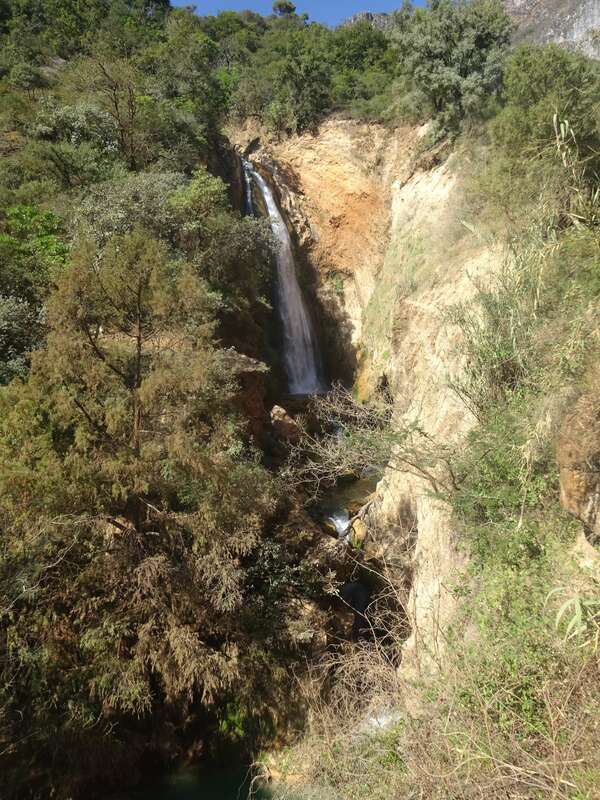 After seeing this waterfall, we began a much steeper descent. 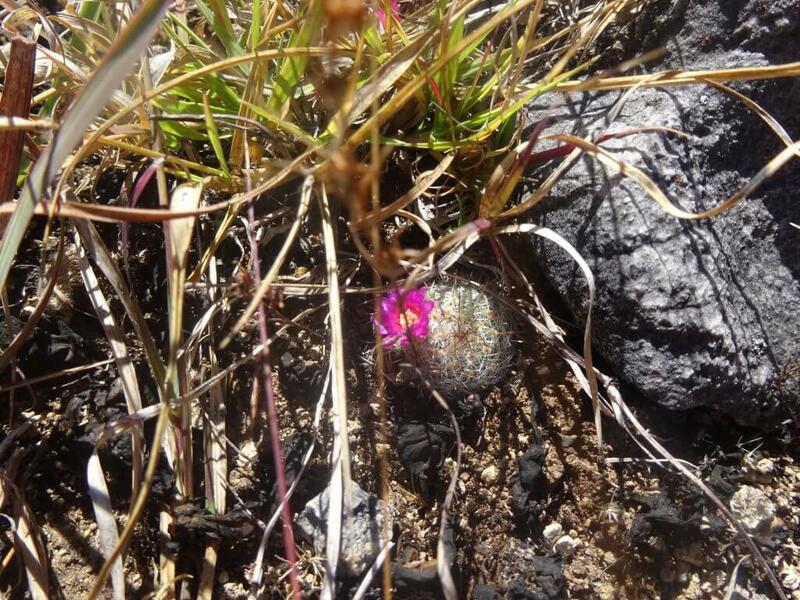 Along the way we passed a plant that Claudia told us had healing properties. It is often used in traditional healing and she was very knowledgeable about it. We left the open fields and went into a forested area. Yves suddenly stopped and asked if any of us were allergic to wasp stings. We were slightly confused, and then he pointed out the wasps’ nest extremely close to the path! Luckily no one had an allergy (that they knew of) but we still ran past! No one likes wasp stings! Not much further from the wasps’ nest, we reached our destination. 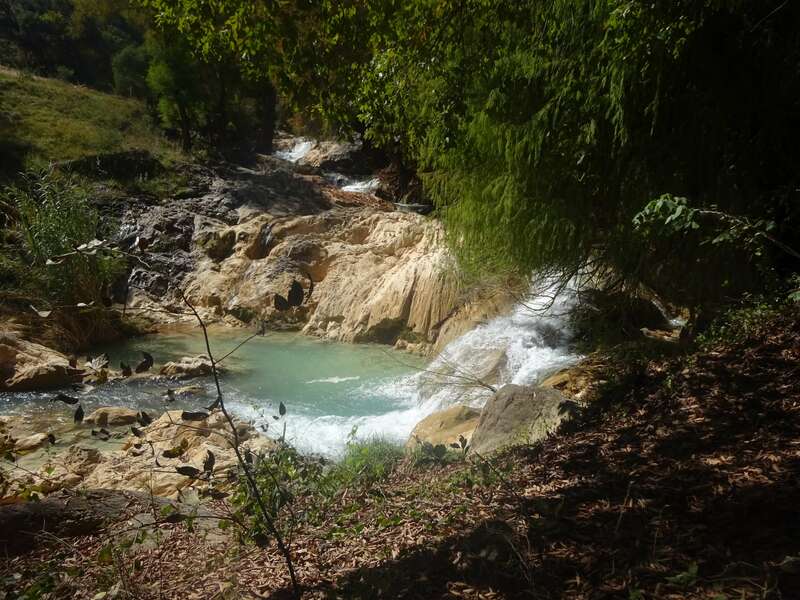 The waterfall was only small, but there were two natural swimming pools, one above the fall and one below. There was an area above the waterfall where we could sit and dump our stuff. Once out of my clothes and in my swimming gear the fun began. It was much easier said than done to get down to the pool. The rocks were not the easiest to walk on; if they weren’t slippery they were just painful. But eventually I made it down and went to walk into the pool. It was FREEZING. Seriously. I couldn’t believe how cold it was! It took a while for me to fully get in, but I managed it. Pure determination to swim. I couldn’t stay in for long though, it was so cold. I normally acclimatise to water quite well, but not this time. After a few minutes it was getting hard to breath it was that cold! And if I thought getting in was difficult, climbing out was even more fun. Getting out the way I got in was not an option; it was too slippy. The easiest way back up was to climb next to the waterfall. So a scramble up it was! How I managed it I’m not sure, but I did. This swim was proving to be a real battle of wills between nature and me. We stayed at the waterfall for quite some time; it was a good spot. Scenic, relaxed and it was nice to just be here. But the time came when we had to start heading back. We went a slightly different way back to the village, but it was still quite the ascent. We were a bit quieter on the way up as we all had to save our energy for the walk! Once again there were some amazing views and interesting plants. One sight I found amazing was an ants’ nest. You may wonder what could be so interesting about a hole in the ground with ants running in and out of it? Well, this one was surrounded by flowers; it was as if the ants were decorating the entrance to their home! I thought it was beautiful. Once we arrived back we went to the Tourist Centre again for lunch. There was just as much food as yesterday! 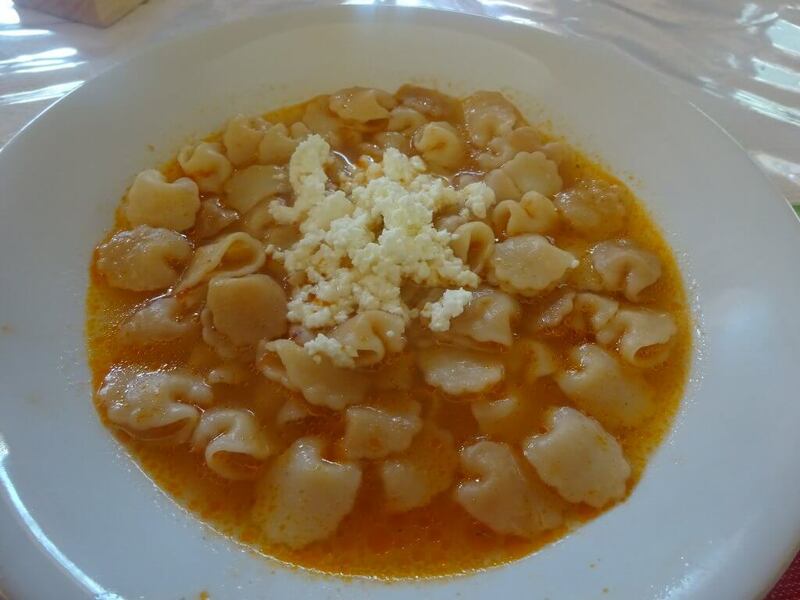 We started with a pasta soup again – in all honest it looked like Heinz Spaghetti (I think only Brits will know what I mean), but it was much tastier. 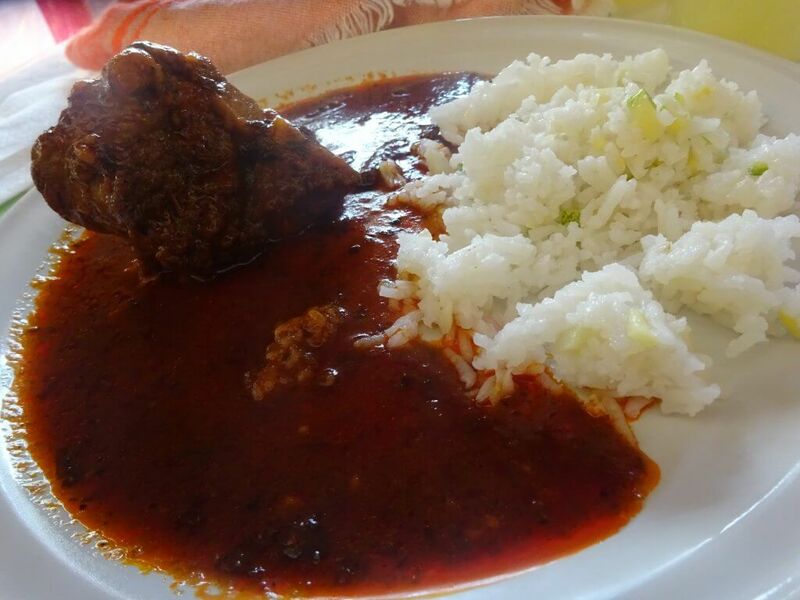 Then we had chicken in a mole, I think it was a mole rojo, but there are hundreds of variations of mole so it’s hard to say! Once again the food was delicious. After lunch it was time to say goodbye to Santiago Apoala (and the dogs that had followed us) and start the long drive back to Oaxaca city. 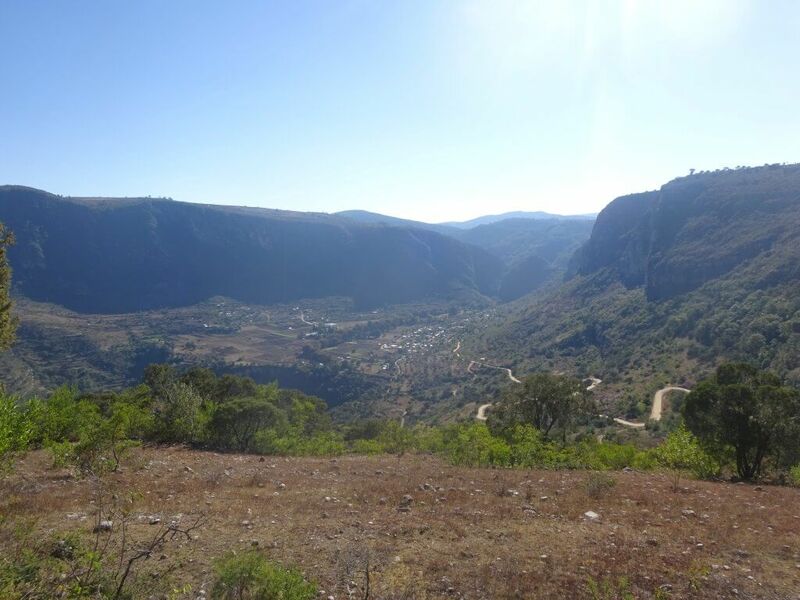 As we drove back we climbed up the valley and Yves showed us why the village is believed to be the birthplace of man. There is a spot where you can stop and look down into the valley, and it kind of looks like a woman giving birth. So I completely get why the locals decided this was the birthplace of mankind. 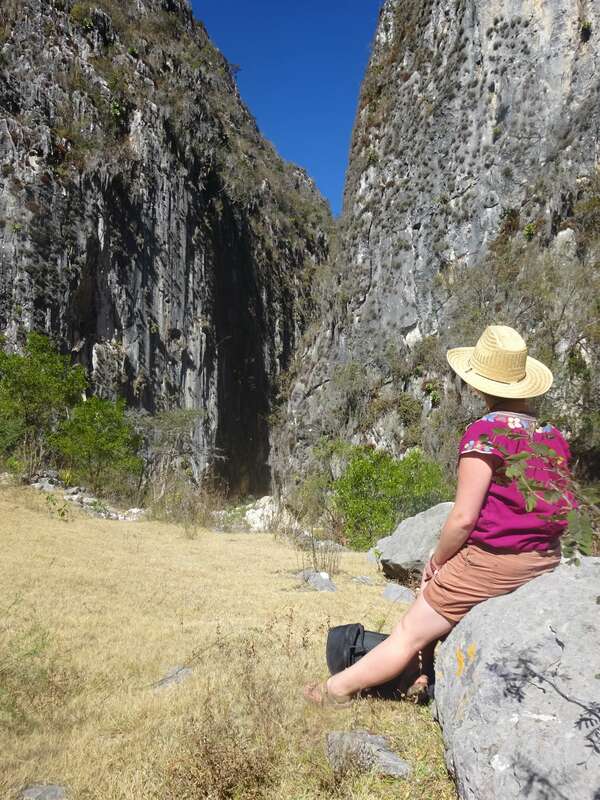 The journey back took us along winding roads and back to our accommodation in Oaxaca. It was an uneventful journey which went pretty quickly as we chatted away. All too soon we were back in Oaxaca saying goodbye as we were dropped of at our accommodation. Me and Dave went back to Luz de Luna Nuyoo, where we were greeted like old friends. 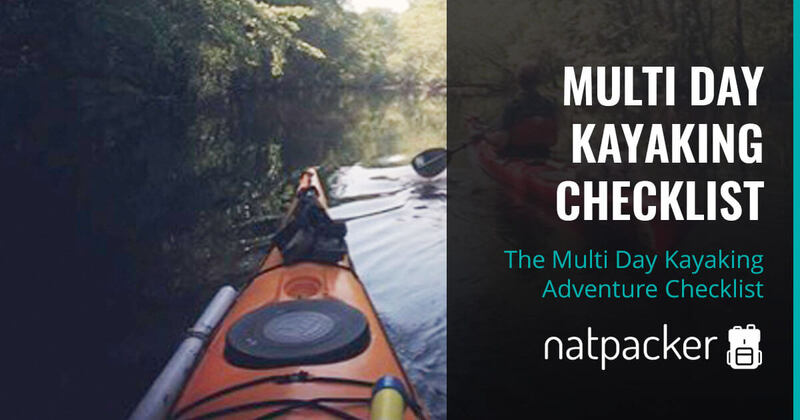 A guest post by Derek, where he shares his multi day kayaking checklist. 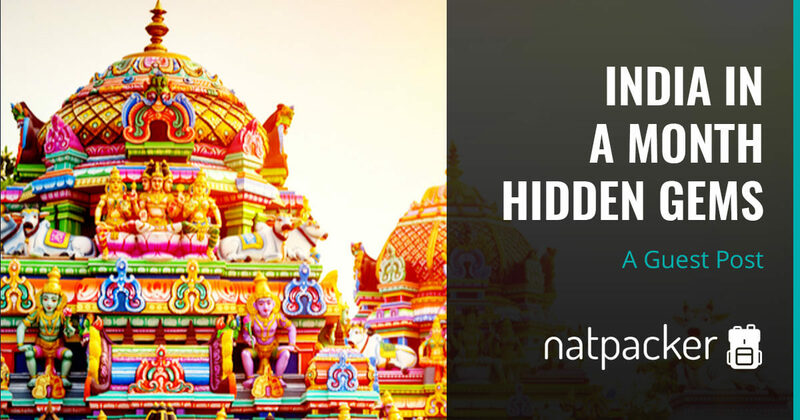 India in a month and hidden gems to visit!